Last summer, I went on vacation out west to see some National Parks (Yellowstone, Glacier, Craters of the Moon). 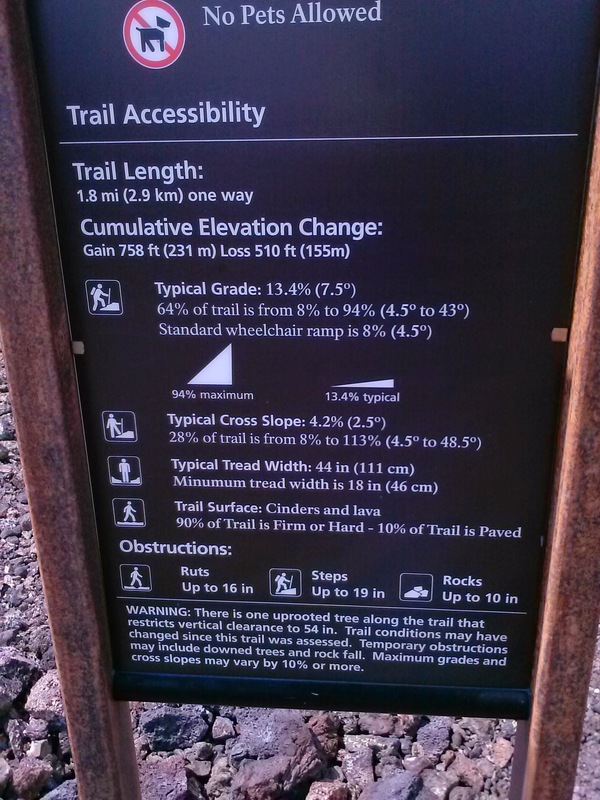 At Craters of the Moon, all the trails had these lovely signs talking about how steep they were – since one of us hikers had a bad knee, we needed to make sure the trails weren’t too tough. 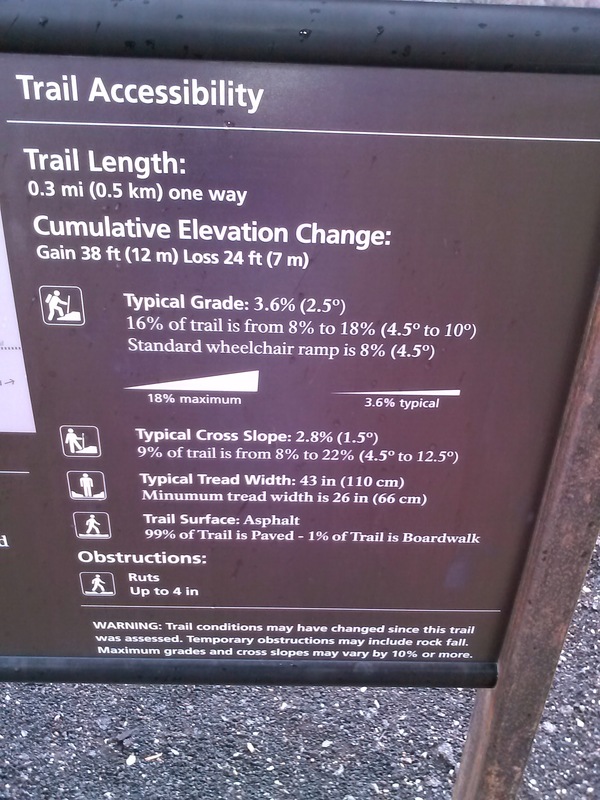 What’s interesting is that they didn’t just talk about the average grade, which many hiking books do (as we learned to our chagrin in Glacier), but also the maximum and minimum. I feel like this is a good opportunity to talk about average rate of change versus instantaneous. 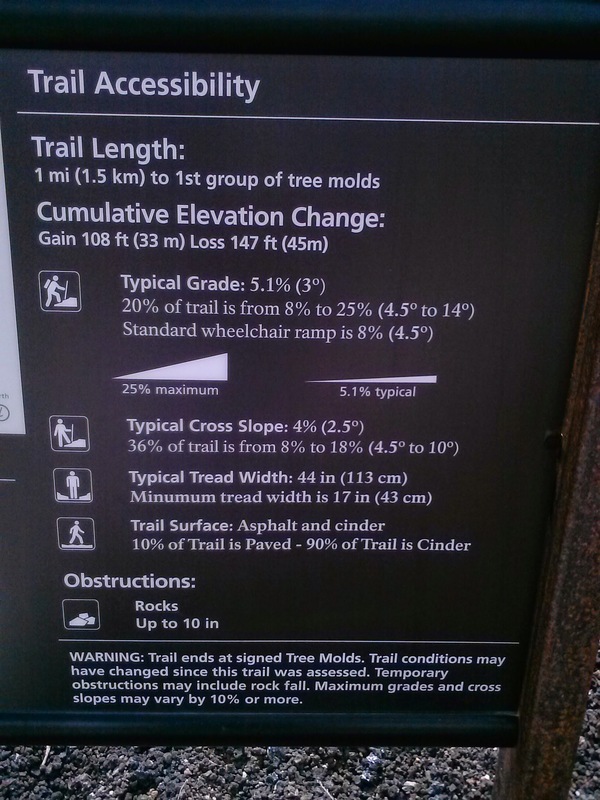 Later on in the trip, we had a discussion about what it means if a trail is twice as steep as another one. 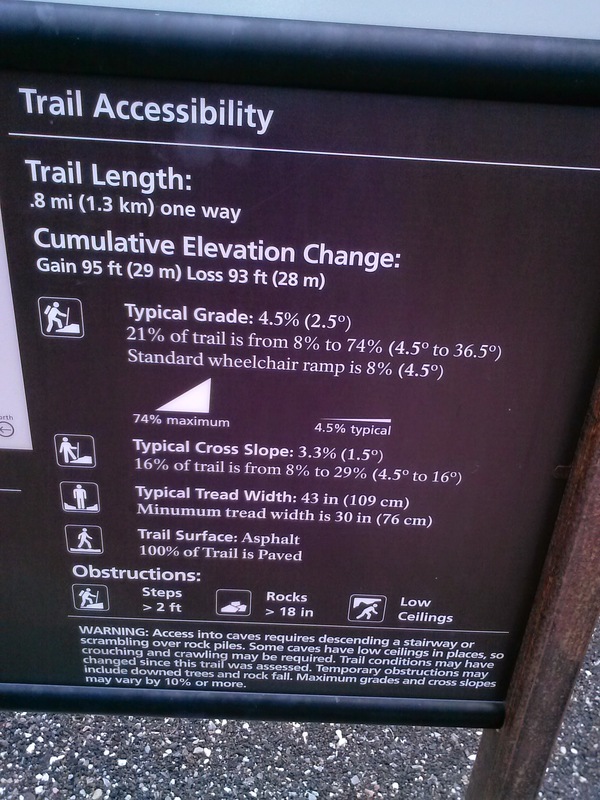 If I told you the the next trail is twice as steep as this one, what would you expect? What would it feel like? Then we also talked about whether we were doubling the slope or double the angle. That distinction is tricky because, for angles less than 10°, which are the most common, the difference between doubling the slope or doubling the angle (up to 20°) is less than 1% extra grade. Anyway, there’s a lot of data here, so I pose to you: what could you do with this? I had this same thought the last time I was here, but I feel it could be fruitful. 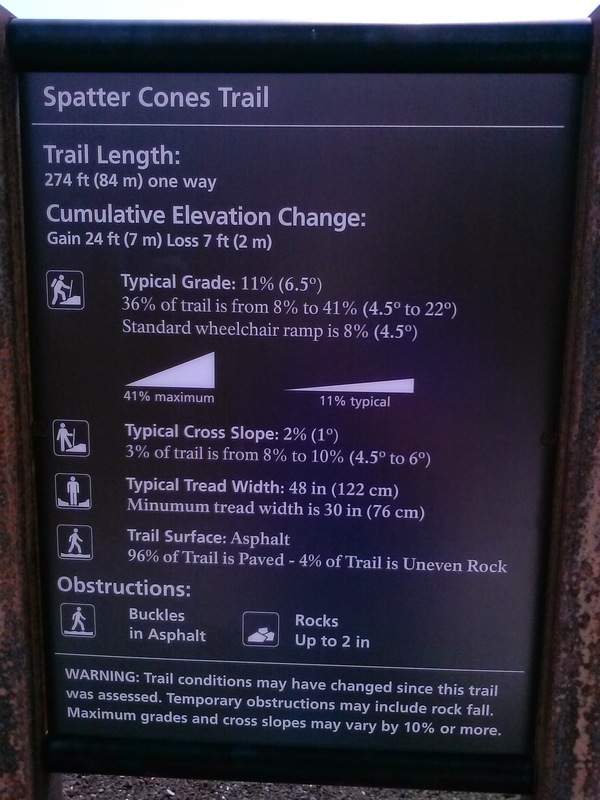 Sometimes there is a route someolace that is “shorter,” laterally, but there are tons of up and down hills between. So is that way really shorter? 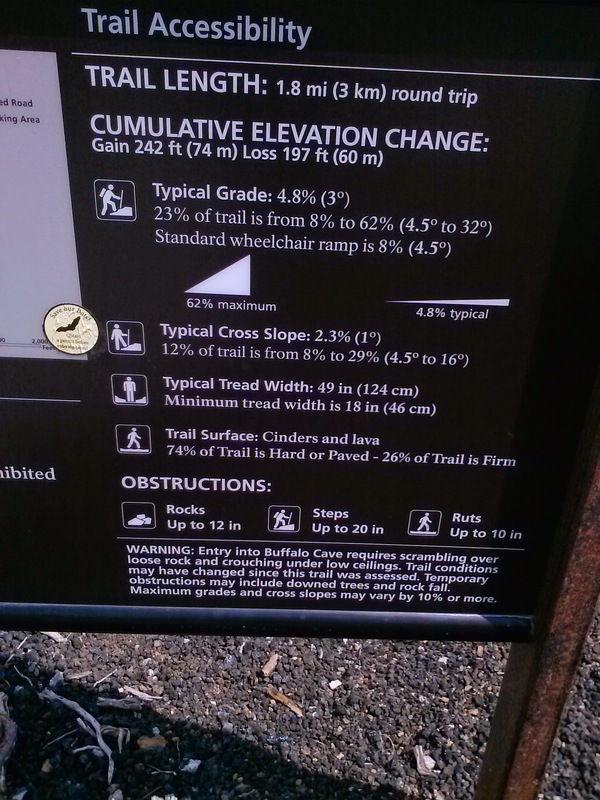 I feel like you can do something with this: use the Pythagorean theorem to determine how far you are actually walking, determine different walking speeds on different inclines, and then get a topographical map and determine the speed and length of different routes, then check what Google Maps says. 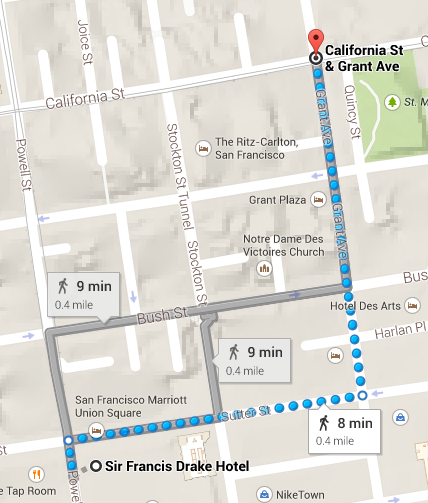 For an example of what I just experienced: because we didn’t really know where we were going, we wound up walking up the giant hill up Powell St and then down the hill on California St, but if we had gone down Sutter first and then up Grant, it would have been much flatter. Today I met a friend for lunch, and we decided to meet halfway between our apartments. To think about where that would be, I used MeetWays, which was useful because it can find that mid-point based on a variety of modes of transportation: car, bike, public transit, and walking. The thing is, my friend took the train to lunch and I walked. 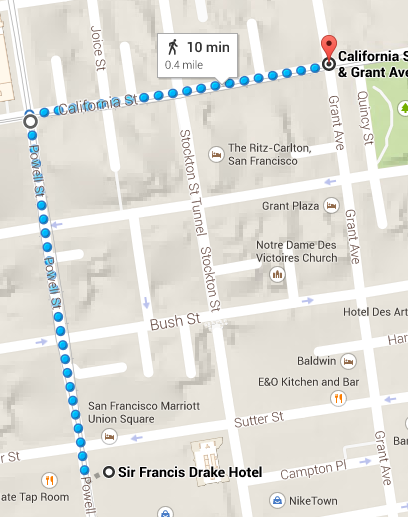 (I based the location on the transit midpoint, but decided to walk for the exercise.) So what counts at the midpoint then? If one person drives and another doesn’t, do you include the time spent finding parking as part of your calculation? Is it based on time, or distance? If we both travel for 45 minutes, but she’s much farther from home, is that still meeting in the middle? Considering everywhere I could walk within 45 minutes and everywhere she could train in that time, is there really only one middle point, or do those rings intersect twice? There are the things I wondered as I walked. Are there other good questions to ask? You can probably, at the least, get a decent rates question out of it. 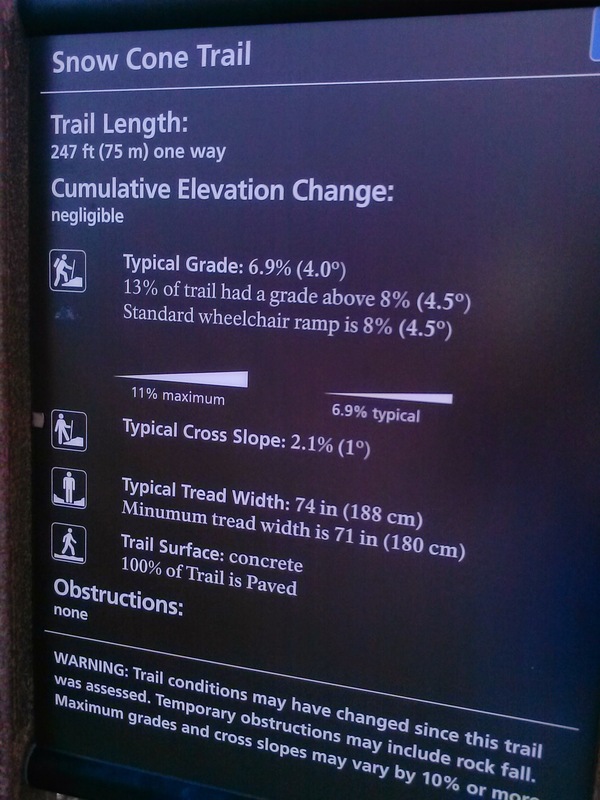 I took some photos today at the AMNH with their scales with the intention of posting them as Estimation180-type challenges. I realize as I review the photos, though, that there were some issues. The numbers fluctuated a lot when I stood on the scales, so the pictures I have vary by a huge margin (+/- 30 pounds to my Earth-weight). 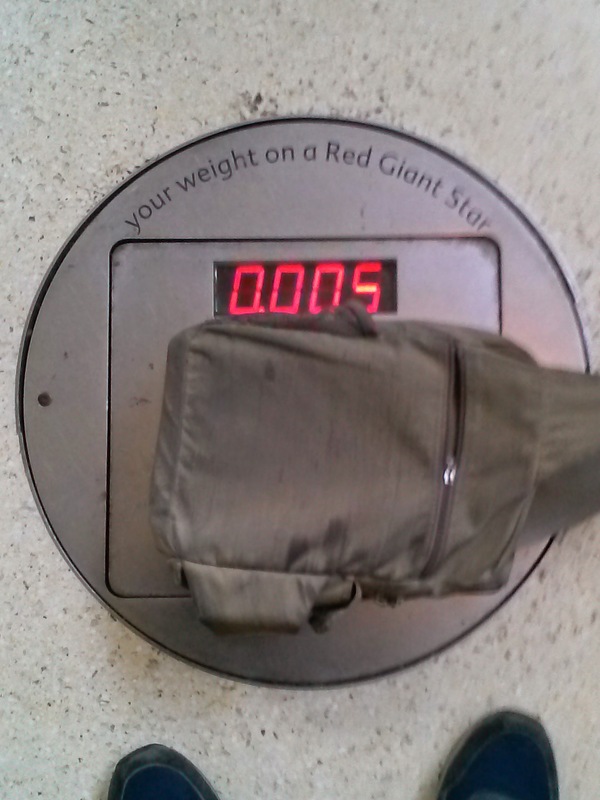 They didn’t fluctuate when I put my bag on, but not every scale register its existence. 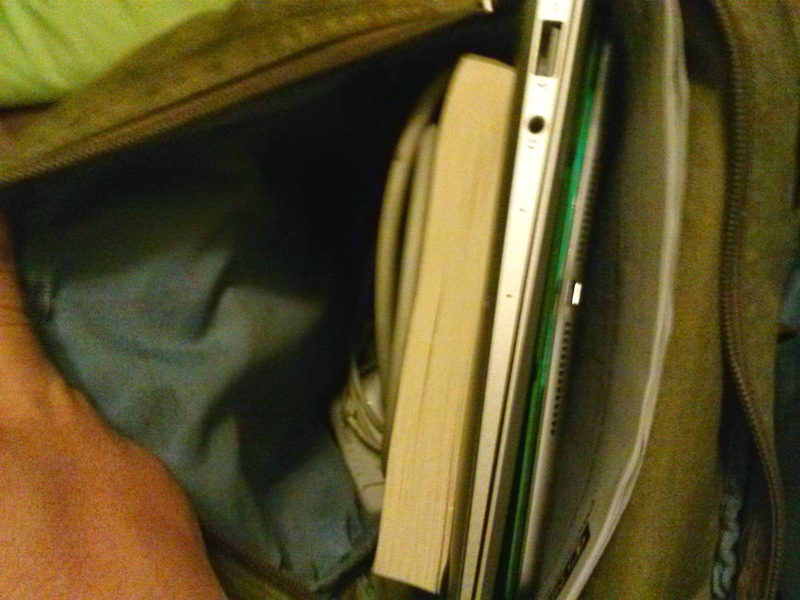 Estimation #1 – Here’s my bag (laptop, iPad, book, charger, 3DS). How much does it way? 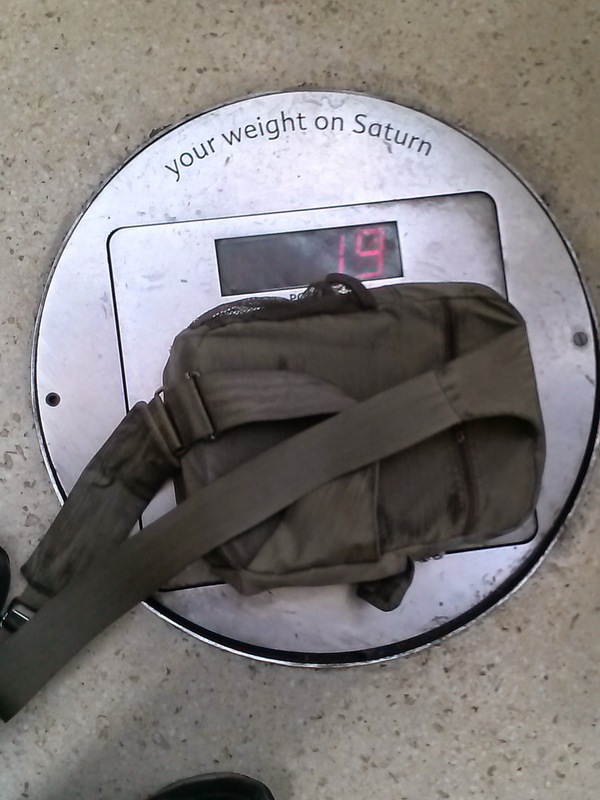 Then the next estimations – how much would my bag weigh on Saturn? How about on the surface of a Red Giant Star? At trivia tonight, one of the bonus round was a matching question – match the 10 movies to the character Ben Stiller plays. We (and by we I mean my teammates, as I know very little about Ben Stiller) knew 7 of the questions for sure, but had no clue for the other three. I figured there were 6 possible ways we could write down our answer – 1 correct way (call it A B C), 3 ways that get us 1 point (A C B, C B A, and B A C) and 2 ways that get us 0 points. (B C A and C A B). Calculating that expected value gets us an EV of 1 point, the same as his suggestion – so, mathematically, they are equivalent. Then it just comes down to your willingness to take that risk, since it’s not a repeatable event. And as we always say every week, go big or go home. I had a “Talking Math with Other People’s Kids” moment back in October that I wanted to blog about, so now is as good a time as any to pull that one out of the drafts folder. My boyfriend’s niece and nephew have recently fallen in love with Star Wars, which, frankly, makes all of us happy. So while at the BF’s parents’ house when they were there, I decided to entertain them by playing the Star Wars theme on the piano. His nephew, Matthew (age 6), liked it and wanted to know how to play it. I thought about how I would describe it to him, so I did the following. “Okay, this key here, I’m gonna call that key #1. So the one next to it is key #2, and so on. So, I’ll write down some numbers and you can know which keys to press.” And I wrote “1 5 4 3 2 8 5 4 3 2 8 5 4 3 4 1. (Then repeat)” He practiced it a few times until he got it, and we were all impressed. But then he wanted to do the next part, which dips into the octave below middle C. So I saw an opportunity. He told me I should call it 9, with the next notes being 10 and 11, since we already did up to 8. I asked him if he thought that might be confusing. “If I were reading it, I would think the 9 should be the one right after 8.” He agreed, so then he said we should call them letters, like a, b, c.
That way if we need to add more notes that go down, we can just use more letters, and if we need to add notes that go up, we can use more numbers. He thought this was a good idea, and so we moved on to playing the rest of the tune. I admit I was thinking of a specific post I had read not long before, which I thought was a TMWYK post but now I can’t find it, where the child invents numbers smaller than 0 using *1, *2, *3, etc. That was my intention with that conversation with Matthew, but if I’ve learned anything from reading all the TMWYK posts, it’s that you don’t push it if the kid isn’t going their themselves. We had to come up with some sort of solution so we could keep playing the song, but once we got something workable, we didn’t need to keep going to talk about the whole negative number system. At the time Kathryn Freed asked me if there was a 0 key, which I said there wasn’t and so the divide between the two types of keys was a little awkward, but it worked out. In the months since, Matthew has been taking piano lessons and learning to read actual music instead of my cockamamie scheme, which is for the best. He’s pretty good at it, too.